We place most of our Erasmus Plus students in carefully selected Host Family or so called Home Stay accommodation. All the families and their homes are vetted by us to ensure the high standards of accommodation are met. The houses are located in all areas of Plymouth and are within a walking distance from City Centre or near a bus route. What is a Host Family Accommodation? 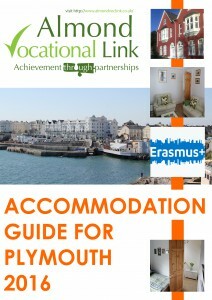 During your Erasmus+ in Plymouth you will be living with a carefully selected by us host family. You will be offered a room in their family home and have access to shared facilities like living room and garden. You will be a part of their everyday life and routine which will help you improve your English. The host family will be there for you to offer helpful tips and useful advice especially when you first arrive and are new to the area. Your Host Family will pick you up from bus station on arrival; bring you to our office for your welcome meeting and drop you off to the bus station on your leaving day. It is likely that there will be other students living with your host family since most of them offer more than one bedroom to let. Whilst living in Plymouth we highly recommend this type of accommodation. Living with native speakers will improve your English language skills and the family will help you understand the culture better. It is always difficult at first to be away from home especially in a different country, but it’s extremely comforting to have someone you can turn to if you need help. Our families are used to hosting students from many different nationalities, various cultural and religious backgrounds and of different levels of English. For those aged 18+, there is no curfew in place and you will be given your own set of keys to allow easy access. We do however ask to respect the families you are living with and behave in an appropriate manner especially in the evenings. This option is suitable for those staying long term (3 months +) and arriving in small groups. The accommodation consists of shared kitchen and bathroom with choice of single and shared rooms. You will have access to internet included in the price and in some cases live without host family on site. All bills are included in price, however you will be responsible for purchasing your own cleaning products, laundry materials and other essentials like coffee, tea, sugar etc. This type of accommodation allows you to cook your own meals but bear in mind that the kitchen is shared with other students. Self Catering Accommodation is essentially a large family home which you will share with other 4-5 students, it offers a lot of independence but also commands a great responsibility. In some cases Self Catering is also available within Host Families. This allows you to prepare your own meals independently but also gives the comfort and security of living with a host family. Please note, we have very limited spaces for Self Catering accommodation therefore we cannot always guarantee availability. Self Catering must be booked with a minimum of 6 weeks notice. You will be living with one of our host families in a choice of single or shared room. Internet access is available and included in fee. Your Host Family will provide you with a breakfast in the morning and a cooked meal followed by a dessert in the evening. You will have to provide your own lunch, either by buying your own ingredients and making it at home, using the cafe at your work placement or buying it from a shop on your way to work. This gives you a great flexibility during the lunch hour. You will be living with one of our host families in a choice of single or shared room. Internet access is available for additional small charge. You Host Family will provide you with all the meals for the day including packed lunch to take to work. The packed lunch usually consists of a sandwich/salad, fruit, crisps/cereal bar, bottle of water. This is a great solution if you are not a fan of cooking and not keen on options offered by workplace cafeteria and shops.